This is the November 2018 edition of our North America Quarterly. It covers all important aspects of the region, with a particular focus on the growth of US production and the impact on regional and global balances for both crude and products. The NAQ is designed to be a comprehensive guide to US and Canadian production, midstream projects, US and Canadian crude balances, regional differentials, and the US refining industry. In Focus – 2019 US Balances: The uncertainty around the production outlook following the recent drop in oil prices is a key variable for next year’s US crude balances. We currently expect a 108.9 mb build in 2019 (including a 15 mb SPR release). In the chapter we outline the details and assumptions behind our production, runs, imports and exports forecasts for 2019. In Focus – US shale—technology does not trump geology: With US supply growth rising to a record high in Q3 18, the key question as we head into 2019 and beyond regards the pace of future growth rates. Has technology really improved to the point that the Q3 18 pace of growth can continue in the years to come? Our medium-term supply forecasts suggest not, with crude supply growth easing from 1.1 mb/d in 2019 to below 0.5 mb/d in 2023. Outlook for North American crude: We expect Cushing stocks to finish this year at 40 mb, then build through H1 19. Next year’s outlook is for a very bearish first half, with no new additional outlets for the hub but more local production still set to flow into Cushing. In the second half, as Permian pipelines start-up, these will steal barrels from Cushing, helping the hub draw down stocks. Outlook for products – Mexico’s energy reform: Lacking proper investment, the Mexican refining system has been steadily deteriorating. Increasing crude throughout remains a top priority for both PEMEX and the new administration. PEMEX would like to increase runs by more than 0.2 mb/d to 0.8 mb/d by the end of 2018, and potentially to 1.0 mb/d by mid-2019, but we remain sceptical. Outlook for production: We remain confident in our 2019 liquids growth forecast of 1.3 mb/d, not least due to the recent collapse in oil prices, which will start pushing realised prices across some basins below producer breakevens. That said, the flurry of M&A activity, which hit a record $50 billion in late 2018, IOC involvement and strong GoM growth, are likely to support production gains. 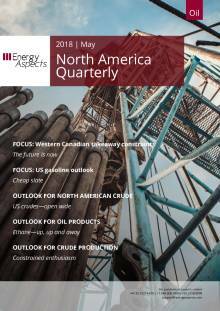 The North America Quarterly also provides a regular, detailed update on: pipeline projects; rail capacity; US PADD-by-PADD crude balances; Canadian regional crude balances; US, Canadian and Mexican regional refinery slates; Canadian crude balances; product demand and cracks; crude imports by grade; shale plays by basin; US independents’ hedging activity in 2018 and 2019; and the latest production data, including rig counts and technological and regulatory developments affecting the domestic oil industry. This is the March 2019 edition of our North America Quarterly (NAQ), previously released in Febru..